I’ve seen a TON of shows in my short time downtown. 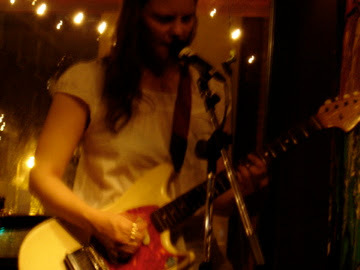 Scout Niblett sent me through a sensical gauntlet on Monday night. 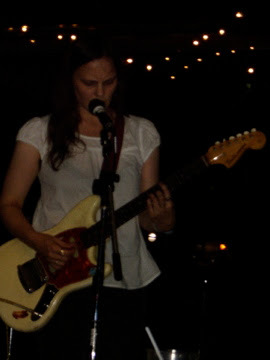 Tara Watts opened the show perfectly, and set the tone for a few quiet, mousy tunes from Scout, including Dinosaur Egg (video down the page in a previous post). This was the disarming part. 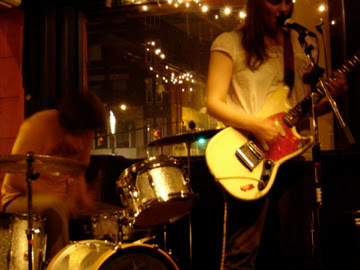 Her simple, beautiful, plinky-plunky songs on her electric guitar gave a reminding sense to performances by Julie Doiron, but with an unyeilding voice. Nothing whispery. It was vocally powerful even when it was calm. When Christian (Christmas) got behind the drums, even when he was tapping, the songs grew legs, and dug deeper into my musical memory, making the songs unheard, yet instantly re-recognizable favourites. She was “givin’ er'” as they say, finding a place to sing heavy-handed, sometimes growly lyrics that clashed so perfectly with the ripping guitar and slamming drums, I was forced to have a large grin, looking around for reaction from the crowd, which she got at the end of each song. I’ll tell you something…I cannot remember this many nights in one month where people are jarred by talent so huge that they are mute throughout the entire show. I was beyond impressed with the performance, and supremely honoured that they played Phog…as her only other Canadian dates (only 3 others) were in Toronto (tonight @ The Silver Dollar), Montreal, and Vancouver!!! She’s playing The Knitting Factory in New York for crying out loud! And she played Phog! I feel very lucky, and now, we can look forward to her return after her European tour which goes until the end of the year. For those of you who need convincing for shows, take my word for it, if you can make it out to her next show…do it! Look her up online, listen to her stuff, and if you find yourself liking it, you will love the stripped down live show. Definitely a great show. Neither of the people I saw the show with were very familiar with Scout, but both left Phog very impressed.It was great meeting you too, Tom. I’ll likely see you very soon.